When you are in Victoria or in Melbourne, you might not witness the equal religious enthusiasm and the same great, rich, and ancient churches and cathedrals in Europe. But don’t get worried about the massive tradition of cathedrals and churches in Victoria depicts the history of the country’s 19th century. In country’s relatively short history, it has built some remarkable Gothic-style cathedrals of its own. Most Beautiful Churches and Cathedrals in Australia. St Michael’s Uniting Church is one of the most beautiful churches in Australia originally built in 1839. The church was once destroyed and then again finally was rebuilt in 1866 by Joseph Reed. The designer of the church was the same that was of the famous Melbourne Exhibition Building as well as The Melbourne Town Hall. The design was inspired by the Lombardic style which was followed by Joseph Reed. He was an appreciator of the late Roman iconic architectural tradition. The architecture reflects a theatre-like design so that everyone in the church could look at the minister and hear him speak. Expect: You’ll love the theatre-like ambiance and the 19th-century structure of the church and indulge in the present-day practices of preaching at the church that mainly focuses on your embrace of the inner well-being. St Paul’s Cathedral was originally designed in a European Gothic style. It was designed by William Butterfield. It’s another 19th-century construction between 1880 and 91. With the designs of Butterfield’s original, in 1926, John Barr redesigned the spires and they were constructed around that time. At once the architecture was destructed in 1885 to accommodate the Cathedral’s southern end. 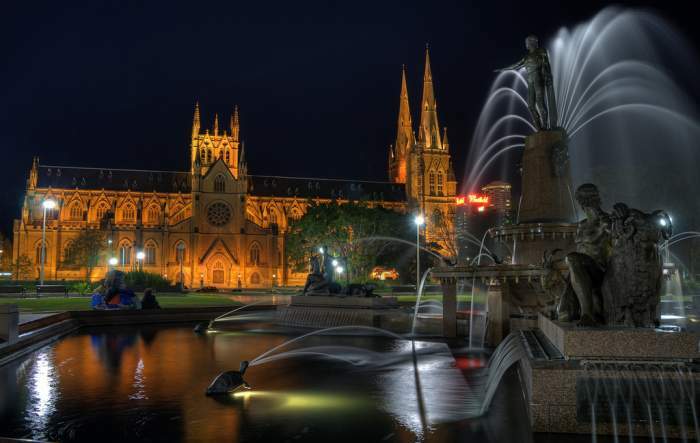 It is known to be one of the most popular cathedrals in Melbourne. Expect: While your visit to the Cathedral, devote a little time to peace. They also have weddings, funerals, and baptisms (ceremony of giving a name to the newborn child) in the cathedral alongside several other religious services. You can also stroll around to admire the magnificent beauty of the church. The church kind of give you the vibes of must-visit pay to it. St. Patrick’s Cathedral is positioned in the heart of Melbourne’s Central Business District. 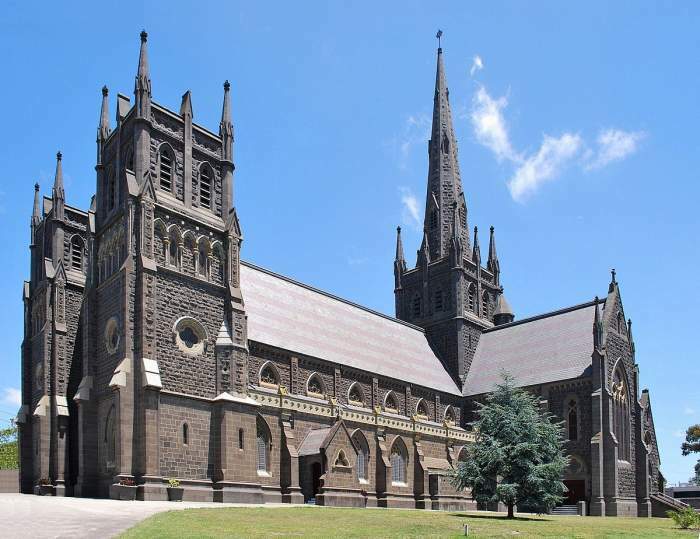 This is acclaimed to be one of the most popular destinations when it comes to churches and also among the most beautiful churches in Australia. The mesmerizing part about St Patrick’s Cathedral is its absolute simple yet elegant design. The architecture is just awesome, visually a retreat and that’s not only because of its exterior. In the interior part, you will see the massive blue-stoned walls, breathtaking and giving it a neo-gothic look. The design of the cathedral was the idea of Architect William Wardell who got inspired by his love for medieval cathedrals of England which was very much prevailing during the 19th century. Expect: See the 19th-century architecture and have a peaceful time at the St. Patrick’s Cathedral. Admire the charm of the 19th century neo-gothic structures and stones. 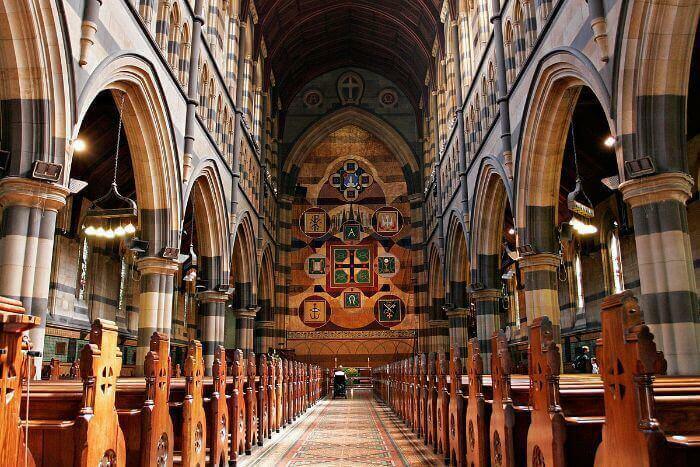 Location: St Patrick’s Cathedral, 1 Cathedral Pl, East Melbourne, VIC, Australia. While appreciating the fascinating beauty of the churches of Australia, Sacred Heart Cathedral will captivate you with not only its history but also with the artistic beauty. The Sacred Heart Cathedral is overflowed with surprises, wonders of architectural captures and serenity of the scenery. The architect of this architecture is William Tappin who built the cathedral in the English Gothic style. The design has attained a structural height, enabling the interior of the church as bright as it could be. If you are a fan of art then pave your way to this well structured, stylish old architecture making your trip a memorable one. Expect: Have a look at the big organ kept inside the cathedral which happens to be one of the rare highlights of the church visit. Here you’ll experience the mass times, ceremonies, baptisms, and rites. There are weddings, baptisms and pre-wedding education in the process. Hit in the immensely rooted history of Geelong’s St Mary of the Angels Basilica. The church was built as per the strategy of a rapidly growing population during the Gold Rush period. That was the time when there were many Catholics in need of a sacred place who lived there and they wanted to copy their religion-dominated life like that of England’s. The town was going through the Gold Rush period the population rose nearly to its four times in numbers and reached 4000. This gave rise to inspiring a larger church to fit in the growing population. The church is renowned to be one of the iconic places in Geelong. 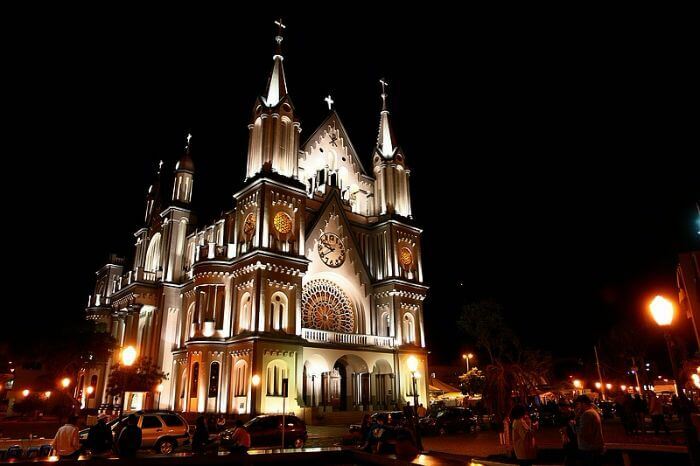 The credit goes to the exquisite designs of this magnificent cathedral-like building. The church is nearly 200 feet long and 130 feet wide which was built spending around 40,000 pounds during the time of construction. Expect: Indulge yourself in the masses and explore the wedding ceremonies and funeral rituals and other holy rites. Location: St Mary of the Angels Basilica, Geelong, 136-148 Yarra St, Geelong, VIC, Australia. St Mary Star of the Sea is known to be the most significant and beautifully designed church in Australia which was built in the year 1900. 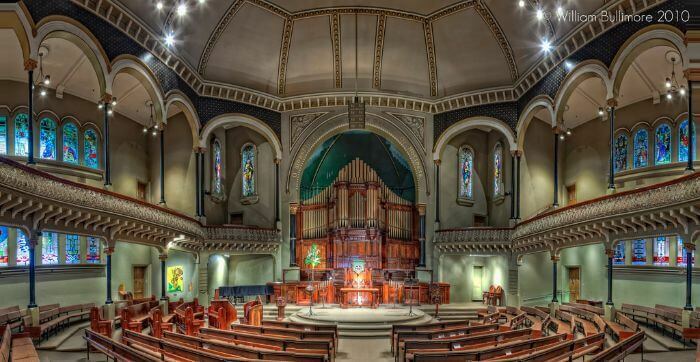 Being one of the most beautiful churches, it happens to be amongst the largest parish churches in Melbourne with an area to hold over 1200 people. The design by the architect Edgar J. Henderson was inspired by the French Gothic styles and the church was built in the time period of eight long years. The determination of such a long time span paid off as the church is acknowledged to be one of the striking and beautiful churches in Melbourne, Australia. Expect: Witness the amazingly stunning beautiful architecture of this gigantic church, take part in masses, pray alone or simply spend some time with yourself in the serenity. St George’s Cathedral is known to be the mother-church of the Anglican Diocese of Perth. 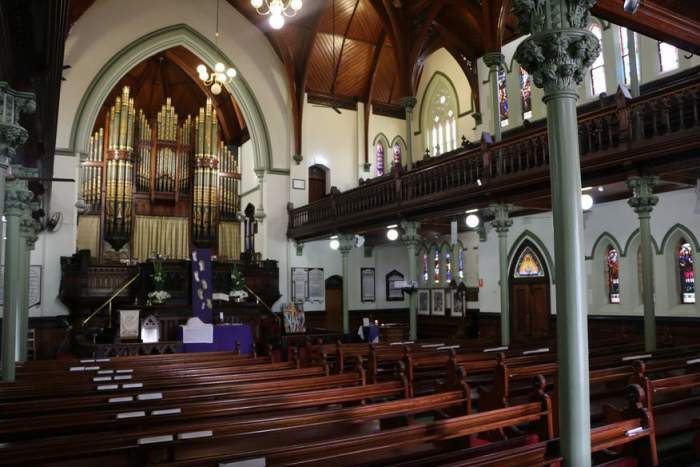 In 2001, it was listed in heritage as it’s a fine example of Victorian Gothic architecture, making an important contribution to central Perth’s streetscape, and is kept in high regard by the community and Anglican church members. The church was built in 1888 designed by famous Australian architect Edmund Blacket. The cathedral belongs to a masterly example of Victorian Academic Gothic architecture. The construction of the Cathedral was made using local jarrah for the arches, bricks from Swan River brickyards, limestone from Fremantle, bluestone pillars from Victoria, marble from Italy, and a Caen stone pulpit carved in France. Expect: Applaud the beauty of the rose-colored brick interior of the cathedral which is simple yet elegant. St Francis Xavier’s Cathedral is a Roman Catholic cathedral located in the heart of Adelaide, South Australia. It is jointly nicknamed the City of Churches. The construction of the cathedral began in 1851, making it Australia’s oldest cathedral, designed by Richard Lambeth. However, the architecture was not completed until 1996. It’s classified as a Gothic Revival building, built in an Early English style. Murphy Bell is the main bell in the tower, which is over 150 years old. The cathedral is surrounded by 13 bells which are ranged by the members of Australian and New Zealand Association Bellringers. Expect: You will see a great mass in the cathedral along with lovely bronze statues of Joseph and Jesus and the flight into Egypt are also featured on the western side of the cathedral. 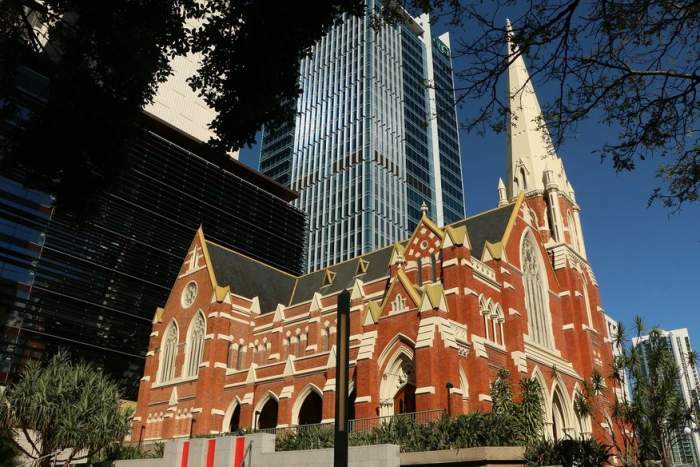 Albert Street Uniting Church is located in the middle of Brisbane’s CBD. The church is the spiritual home of Wesley Mission Queensland. This heritage listed architecture was designed by George Henry Male Addison and built from 1888 to 1889. In Brisbane, by the time of early 20th century, it was the main Methodist church in the city and became the Uniting Church after its formation in 1977. The design is in red brick color with white Oamaru limestone trimmings. The spotlight is the pulpit and decoratively painted pipe organ. Expect: You will see the annual conferences opened each year in church and significant occasions for Methodists were celebrated there. 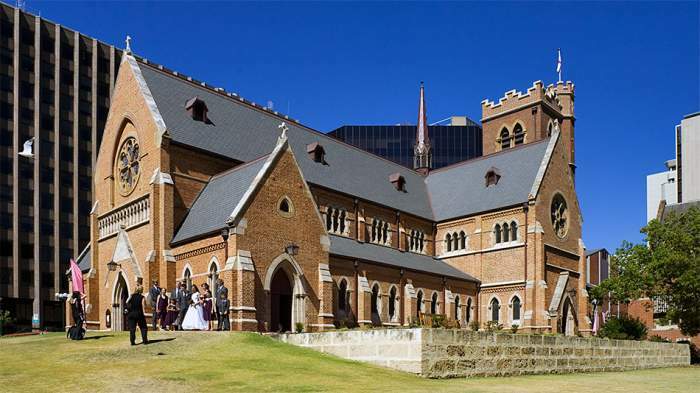 The picturesque Saint Mary Cathedral is located in the heart of the City of Sydney. It was built in the academic Gothic style. The completion of the church took three main stages. The cathedral has got the greatest length of amongst any other church in Australia (though it’s neither the tallest nor largest overall). The first stage was completed in 1865, then in the 1920s, the second phase was put to rest by the Great Depression. And the final phase included closing the cathedral from 2006 until 2009, when a second spire, new seating arrangements for 1,600 people, and an underground community center were revealed. It’s one of the most beautiful churches in Australia. Expect: The lateral view of the building from Hyde Park is just amazing with pointed arches and simple tracery.